The Secret Life of Snowboard Instructors | Ellen Says Hola! 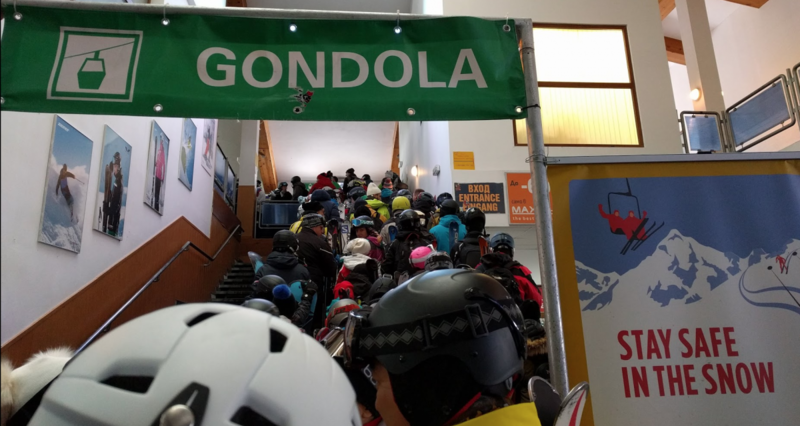 This story is part of a series, Gondola Life. Every morning to get up the mountain in Bansko, we share 35 minutes in a cramped gondola car with a few strangers. Then when the day is over, we do it again. This is usually a pretty silent affair — people are tired going up and exhausted coming down — but sometimes the atmosphere is just right, and we get a glimpse of other lives on the mountain. There’s a subset of the population in Bansko who practically live on the mountain: ski and snowboard instructors. They’re up first, they get priority boarding (swoooon – at peak times you can wait an hour or more), they work four hours a day, they’re crazy fit, and a few are just crazy. On my first solo ride up for my 9am snowboard lesson (ugh single digits), I sat across from a set of three snowboard instructors. It was early. Each cupped a small Nescafé out of a disposable cup (darn near the only way coffee is served in this town). As we progressed up the mountain they settled into an ease and chatter, an obvious routine unfolding. Random breakfast assortments came out of rucksacks (one offered me some pumpkin seeds and nuts; I accepted), they compared what each other was eating (“What is that, a smoothie?” “It’s a protein shake!” “Ew.”*), set the coffees down between their feet despite the gentle sway and occasional rumble of the car across the cable towers. At the halfway point they began to prep themselves for the cold air, cinching glove straps and zipping the thousands of zippers on their matching ski jackets. After the one on my left braided her hair, she drew her coworker’s head down so she could check her reflection in the goggles on top of his head. He had zero reaction to this, carrying on with the final dregs of coffee, like it happens the same every day. *This conversation unfolded in Bulgarian, but the expressions were universal. And that shake looked gross.